We made another state change today. We had breakfast in New Mexico and lunch in Arizona. The Mustang has been acting up a bit so we made it a priority to get to Holbrook and locate a shop. Mechanic Frank rolled up his sleeves and got right to work. A few adjustments here and there, the replacement of a 45-year-old fuel filter, and we were out the door. (Unfortunately, it now looks like we need a new fuel pump.) We had been hoping to stay at the Wigwam Motel in Holbrook but they were booked. So, we checked into another motel and went up the road to visit the Painted Desert and the Petrified Forest. You'll have to see our photos. These places (colocated in one park) are amazing. 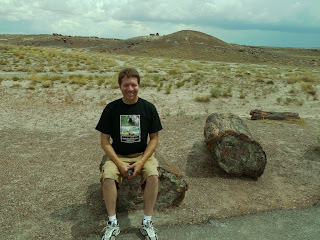 I was particularly impressed by the petrified logs that are millions of years old. Crikey! After all of this driving, my legs are starting to feel like petrified wood. Hopefully after a good night sleep I'll be ready to go to the Grand Canyon. Soon after leaving Gallup, we crossed the state line into Arizona. We continued on the scenic road to Holbrook, only 96 miles away. When we arrived, we went straight to the mechanic who inspected the Mustang and fixed a few things. We dropped our stuff off at the motel and got some lunch. We then backtracked to the Petrified Forest/Painted Desert National Park and toured the beautiful cliffside road of the Painted Desert. In the Petrified Forest, large logs of wood turned into stone line the now empty plains. A huge summer thunderstorm hit Holbrook when we arrived so we ended our day indoors.